Unlike many interior designers, I did not rearrange my room monthly from the age of 5. However, whenever my mom had friends over for dinner or hosted a holiday, the table setting was MY domain. I loved hunting through cabinets for the right dishes, arranging the flowers purchased at Star Market, and choosing linens perfect for the occasion. In fact, to this day, my favorite part of throwing a party is setting the table. 1. For a springy lunch with friends, start with basic white dinner plates (my favorites are these from IKEA) and your own cutlery, then add the Somerset Napkin from Anthropologie ($10), Reactive Salad Plates from Sur La Table ($7.95), Daily Bubble Glasses from ModCloth ($24.99 for 2), and a small bouquet of coral ranunculus (image via Pinterest). 2. There’s no reason you can’t dress up the table for your kids…half of the dining experience is in the presentation! Again, start with your white dinner plates, cutlery, and glassware, then add these great cork-backed placemats from A Farmer’s Daughter ($40.50 for 4), black modern bowls from World Market ($47.94 for 6), black ticking stripe napkins from Little Blu Nest ($14 for 4), and a big bowl of red grapes in the center of the table for all the little hands to serve themselves (image via Pinterest)! 3. Get ready for summer with this coastal inspired setting. Breakfast by the ocean? Start with white dinner plates and cutlery, and add Honfleur Linen Napkins from Fresh American ($48 for 4), Naturalist Outdoor Chargers from West Elm (on sale for $24.99 for 4), Clara Tumblers from Williams-Sonoma ($27.95 for 4 short), and a few blue hydrangea in a simple glass vase (image via Pinterest). 4. Bring the summer picnic inside with this bright and colorful setting. Get the white dinner plates, glassware, and cutlery together and add Jolie Napkins from Furbish ($40 for 4), Laurentide Side Plates from Anthropologie ($12), Vista Square Placemats from Crate & Barrel ($10.95), and a gathering of gorgeous succulents (image via Pinterest). 5. 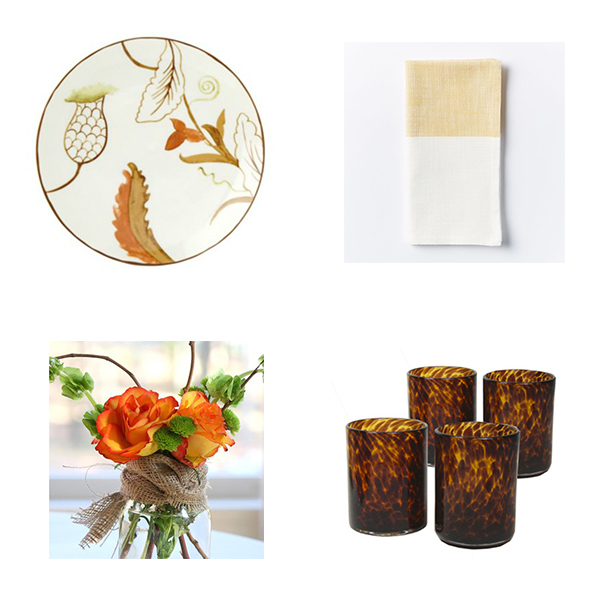 Finally, bring elegance to your table with summery earth tones. White dinner plates and cutlery will serve as a base for the Melange Leaf Print Salad Plates from Ballard Designs ($49 for 4), Center Stripe Woven Napkins in Horseradish from West Elm ($24 for 4), Tortoise Shell Rocks Glasses from Furbish ($50 for 4), and a small arrangement of Bells of Ireland and orange roses (image via Pinterest).